First Holy Communion includes a family preparation program reinforced by the Wednesday night Religious Education classes in second grade. Contact Mary Luebke for info at 608-526-4424. In the United States, the body of Bishops determined that Communion should be received standing, and that a bow is the act of reverence made by those receiving. These norms may require some adjustment on the part of those who have been used to other practices, however the significance of unity in posture and gesture as a symbol of our unity as members of the one body of Christ should be the governing factor in our own actions. The person distributing Communion says audibly to each person approaching, "The Body of Christ." This formula should not be altered, as it is a proclamation which calls for a response of faith on the part of the one who receives. 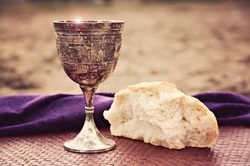 The communicant should audibly respond, "Amen," indicating by that response his or her belief that this small wafer of bread, the wine in this chalice are in reality the body and blood of Christ the Lord.